WASHINGTON — One of the hard-bargain drivers from the U.S. side of the North American free-trade negotiating table is bringing his powers of persuasion to bear on the next challenge facing the new trade pact: The U.S. Congress. Deputy U.S. Trade Representative C. J. Mahoney, a fixture of the 14-month negotiation process that culminated last October in the U.S.-Mexico-Canada Agreement, urged a gathering of American mayors Wednesday to lobby Capitol Hill lawmakers to ratify the deal. "All Congress has to do is pass it, and that is where I hope you all can help us," Mahoney told a panel discussion during the winter meeting of the United States Conference of Mayors in Washington. Ratification in both Mexico and Canada has largely been seen as inevitable; Martha Barcena Coqui, Mexico's ambassador to the U.S., told the panel she expects the agreement to come to a vote in the next session of her country's Congress, which gets underway next month and which doesn't require a separate implementation bill. In Canada, the majority Liberal government makes a “yes” vote all but a foregone conclusion. But amid political turmoil in Washington — where the White House is at war with Democrats over President Donald Trump's border wall plans and a partial government shutdown has entered its second month — nothing these days is a given. Canada's ambassador to the U.S., David MacNaughton, who joined the panel after Mahoney had left, raised one particular sticking point: The fact that the Trump administration has not yet made good on its commitment to lift its punishing national-security tariffs on steel and aluminum exports. "This is causing distortions in the marketplace, it is causing all three countries to lose opportunities, it is increasing costs for consumers," said MacNaughton, who closed by quoting the president's own tweet from March 2018 committing to lifting the tariffs once a new trade agreement was in place. "He has now said this is a fair deal, a good deal, the best deal that's ever been done," MacNaughton said of the president. A number of U.S. manufacturing groups reiterated that message Thursday as they described the lingering pain that the Trump administration's protectionist strategies have wrought, in particular the metals tariffs — 25 per cent on steel and 10 per cent on aluminum. "The continued imposition of steel and aluminum tariffs, particularly on Canada and Mexico, are extremely harmful to our industry and risk undermining all of the potential benefits of the USMCA," said Matt Blunt, a former Missouri governor who's now the president of the American Automotive Policy Council. It currently costs $464 more per vehicle to build a passenger car in the U.S., with between $275 and $300 of that cost a direct result of the steel and aluminum tariffs, Blunt said — a significant burden in an already low-margin business. "We think it's imperative that the tariffs on Mexico and Canada be removed." 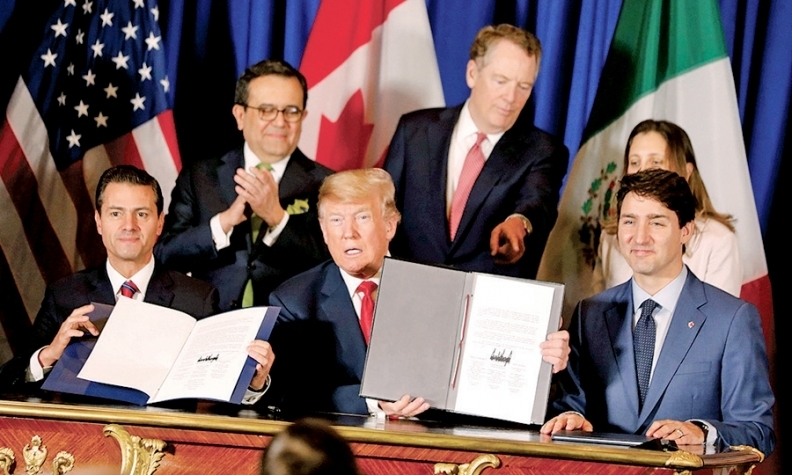 A number of prominent Democrats — notably House Speaker Nancy Pelosi, currently the most painful congressional thorn in Trump's side — have complained that the USMCA lacks meaningful mechanisms to enforce new labour and environmental standards. And relations between Capitol Hill and the White House are at such a low ebb that some fear the president's enemies are determined to deny him any political wins. "If members of Congress can put politics aside and focus on the substance, I have no doubt that this will pass overwhelmingly in both houses," Mahoney told the mayors, describing the deal as the most bipartisan U.S. trade deal ever negotiated, thanks to the political foresight of his boss, U.S. Trade Representative Robert Lighthizer. "Throughout the negotiations — well before the results of the midterm elections were known — we worked very closely with Democrats to ensure that the final agreement reflected their priorities," he said, citing the labour and environmental clauses in particular. Paul Dyster, the mayor of Niagara Falls, N.Y., told Mahoney the often-acrimonious negotiating process has had a negative impact on his community's economic prospects, given how closely integrated it is with Canadian interests. "The rhetoric that was used in this negotiation was shocking, when you hear it used in reference to the leaders of countries that have been your strongest allies and trade partners for a long time," Dyster said. "For those of us on the border, whose economies are very fully integrated with the Canadian economy, that use of old-fashioned protectionism to try to advance the interests of the United States to take a shot at Canada — it kind of hit us in the foot."